Go to original pattern for design DROPS 91-6. 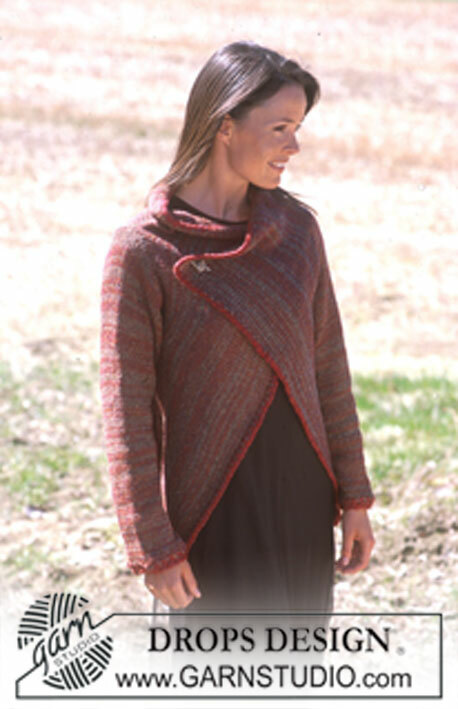 Knitted DROPS jacket in squares with crochet edges in ”Silke-tweed”, ”Alpaca” and ”Eskimo”. DROPS Circular needle size 5 mm. 17 stitches x 22 rows with needle size 5 mm and 2 strands and stocking stitch = 10 x 10 cm. Parts of the garment have been knitted by machine, so the garment in the picture has a slightly striped effect. 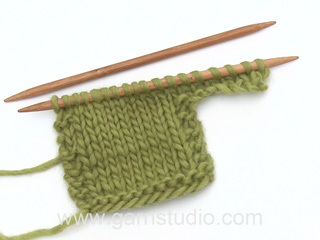 Normal hand knitting will give a more even effect. Body: The whole body is worked in one piece, back and forth with circular needle. The jacket is worked from the right band (cast on edge) towards left band (cast off edge). See photo of pattern no 91-9 to see how the jacket is worked. Cast on 107-112-118-122-128 stitches with circular needle size 5 mm and 1 strand Silke-tweed and 1 strand Alpaca. Work 2 ridges and then continue with stocking stitch, but the outermost 2 stitches in each side are worked in garter stitch to finished length. When piece measures 25-26-27-28-29 cm work the next row from the right side as follows: Knit 21-22-24-24-26 stitches, loosely cast off the next 32-34-36-37-39 stitches for armhole, knit 54-56-58-61-63 stitches. Then work 4 rows stocking stitch on each side of the armhole (remember the 2 stitches garter stitch outermost in each side). The next row is worked as follows from the wrong side: Purl 54-56-58-61-63 stitches, loosely cast on 32-34-36-37-39 new stitches, purl 21-22-24-24-26 stitches (remember the 2 stitches garter stitch in the sides). 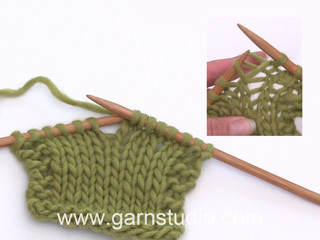 Continue with stocking stitch until piece measures 61-64-67-70-73 cm. Now work the next row from the right side as follows: Knit 21-22-24-24-26 stitches, loosely cast off the next 32-34-36-37-39 stitches for armhole, knit 54-56-58-61-63 stitches. Then work 4 rows stocking stitch on each side of the armhole (remember the 2 stitches garter stitch in each side). The next row is worked as follows from the wrong side: Purl 54-56-58-61-63 stitches, loosely cast on 32-34-36-37-39 new stitches, purl 21-22-24-24-26 stitches (remember the 2 stitches garter stitch in the sides). 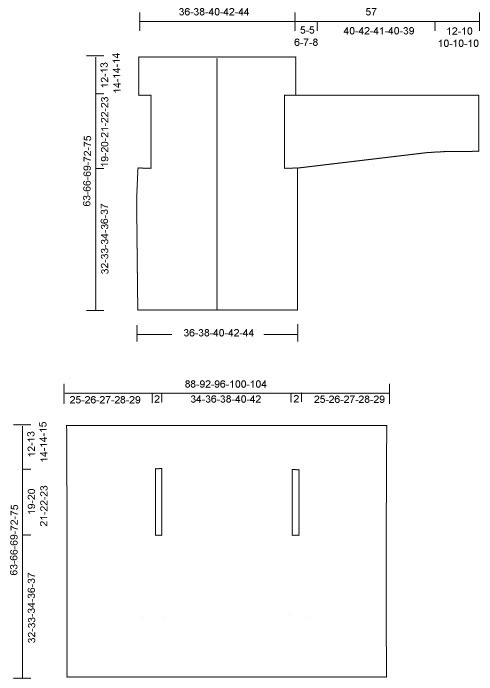 Continue with stocking stitch until piece measures 87-91-95-99-103 cm. Work 2 ridges and loosely cast off. Sleeve: Cast on 47-48-49-51-54 stitches (incl. 1 edge stitch in each side) with needle size 5 mm and 1 strand Silke-tweed and 1 strand Alpaca. Work 2 ridges then continue with stocking stitch. When piece measures 12-10-10-10-10 cm, increase 1 stitch in each side every 4-4-3.5-3-3 cm a total of 10-11-12-13-13 times = 67-70-73-77-80 stitches. 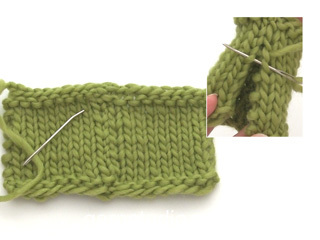 When sleeve measures 52-52-51-50-49 cm, decrease for sleeve cap in each side every 2nd row: 3 stitches 1 time, 2 stitches 3-3-4-5-7 times and 3 stitches 1 time. Cast off the remaining stitches, piece measures approx. 57 cm. Assembly: Sew sleeve seams inside the 1 edge stitch. Sew in sleeves. 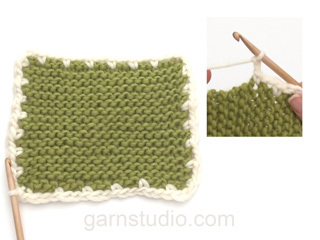 Crochet edge: Loosely crochet with hook size 6 mm and Eskimo along all edges as follows: 1 double crochet in stitch, * 1 chain stitch, skip approx. 0.5-1 cm, 1 double crochet in next stitch *, repeat from *-* and finish with 1 chain stitch, skip approx. 0.5-1 cm and 1 slip stitch in double crochet at beginning of round. At bottom of sleeves, work a second round. Round 2 is worked as follows: * 1 double crochet around chain stitch from round 1, 1 chain stitch *, repeat from *-* and finish with 1 slip stitch in double crochet at beginning of round.